Recently, Adidas have been putting a lot of effort in to fitness technology and football technology. As a sport, football in the UK now seems more ready to embrace technology than ever before. With the adoption of goal line technology coming in time for the Fifa World Cup in Brazil next year, it seems like a good time to be focussing on this potentially lucrative space. 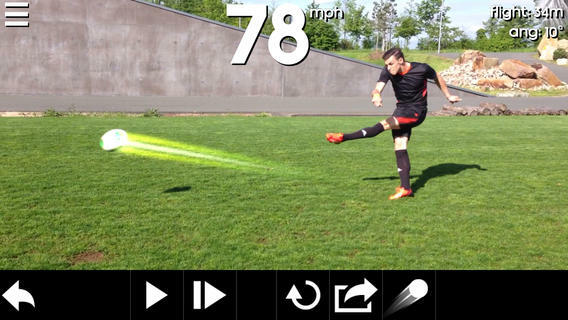 As such, Adidas have launched Snapshot, a new football tracking app on iOS. It’s currently available in the App Store on iPhone and iPod touch The app enables you to track the speed of your shots, as well as the trajectory that the ball follows and its ‘time in flight’. Snapshot requires you to record your football training using your devices camera. This has the potential to make a big impact on football training, from the grass roots right the way through the game. The player can record their own shots using their own iPhone, or perhaps more realistically, a coach can use the app to track their players. In addition to the stats, the app also allows for slow motion playback of the training session, which has obvious benefits around improving technique. The app stores your progress in a library section, allowing you to measure and improve over time. Adidas have revealed that a number of their most high-profile players are already using the app, and Adidas see this as an opportunity to stay at the ‘forefront of innovation and technology in football’, according to Bob Kirk who is a senior development engineer at Adidas. Snapshot is Marketed around the Premier Leagues current super-star, Tottenham’s Gareth Bale, the app is free to download. Bale has a number of sample shots on the app, with his best effort registered at 78MPH, covering 34 metres of flight and a 10 degree angle. For the socially inclined, you are encouraged to share your best efforts on the regular social platforms, including the usual suspects of Facebook and Twitter. Adidas are looking to bring a social competition aspect to Snapshot, whereby people from all around the world can compete to register the most impressive stats. You can download the Adidas Snapshot app on to your iPhone and iPod touch via the App Store, and the app is available for download now.